Club USA is extremely proud to provide to Littleton a family friendly fitness club with childcare. We offer kid-sitting services in our 1590 square foot Kids Club (nursery) to our members while they are working out. The Kids Club (nursery) is designed and staffed to provide to children from 8 weeks to 8 years of age a safe, clean environment. If your child is older, no problem! Kids from ages 8 to 12 years old have the opportunity to enjoy Kids Acton Fitness. No matter the age of your children, we are the gym with kid care for the whole family. To learn more about our USA Kids Club, you can email us at membership@clubusa.net. We offer a wide variety of organized activities for your children including arts and crafts, Little Members Academy, toys, books, a big screen television and much more. And our friendly support staff are experts in childcare and will have your kids not wanting to leave when you finish your workout. To take your worries away and let you work out with peace of mind, Club USA provides video camera feeds showing activities that are going on in the Kids Club (nursery). You can watch your children enjoy themselves using our viewing monitors that are conveniently located in the Ladies Locker Room and upstairs in the Weight Room. We are focused on being the best gym with kid care around. We will watch over your children for up to three hours per day. We always ensure that your children are being closely monitored and engaged with. For the younger ones who are still in diapers, Club USA Staff will change them, allowing Mom or Dad to focus and enjoy their workouts. Teething? No problem. Club USA also provides cheerios, guaranteeing comfort for both the mouth and the tummy. The Kids Club (nursery) staff is infant CPR/AED trained and certified, and we have also been through a child food allergy class. When you join our fitness club with childcare, you will know your kids are safe and sound. To sign up for a membership that will give you access to our Kids Club and Kids Action Fitness, contact us at membership@clubusa.net or fill out the form below. 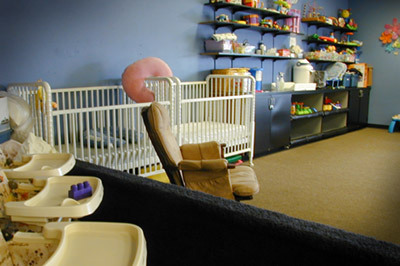 No reservations are required to enjoy your Littleton fitness club with childcare!